Gourmet Pens takes us to a beautiful shop called The Posthumus (De Pothumus Winkel) in Amsterdam. Isn’t it gorgeous? All those stamps and seals! Amazing. Scribbles and Stationery shows off her September Moleskine Journal in this post. Love her pages. Dave Rea has created an indexing app called Indxd and I’ve signed up for an account. It makes our written journals searchable! And they are backed up. He’s a genius. I found myself inspired and hopeful for the future when I found the Cursive Logic website. Linda Shrewsbury has created a system that teaches cursive writing in 4 lessons. Amazing. Read about the touching desire that got it all started: a student wanted to be able to sign his name. Support them and keep cursive writing alive. As a TWSBI Eco owner (and new to the TWSBI brand) I was heartened by Dave Rea’s post on why my TWSBI Eco won’t break. He talks about the phenomenon of certain TWSBI models breaking. Sometimes. And he illustrates why some models break and why the Eco probably won’t. He’s an engineer so knows what he’s talking about. The science he presents is easy to understand and super interesting. Go TWSBI Eco! 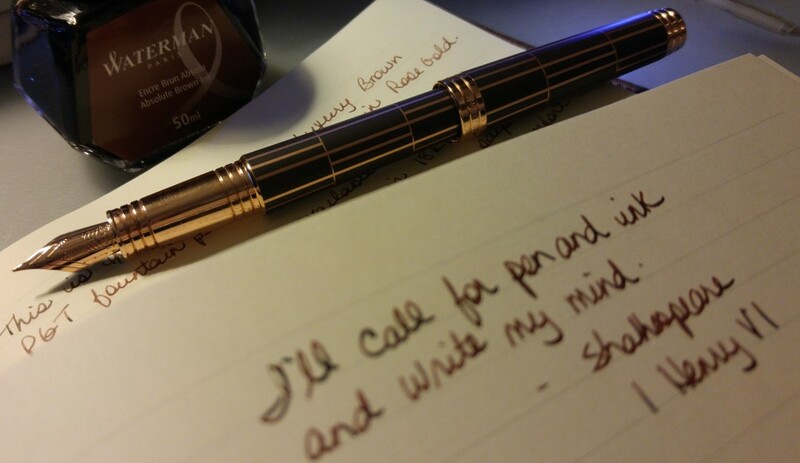 Many thanks to Gourmet Pens for introducing me to Canadian pen company, Knight’s Writing Company. I get the sense they are relatively new but they have an impressive selection and low shipping rates (within Canada at least; not sure what their international shipping runs). I enjoyed the blog as well. It’s so great to have one more Canadian online pen resource! !